Hay Fever is of such a particular period and the Bliss family so sophisticated and witty that, initially, I couldn’t say the Otto family compares to them in any way. 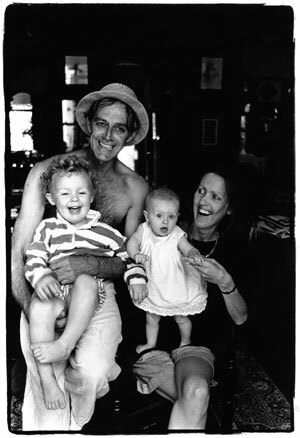 But, recalling my childhood, I realise that perhaps our family might be viewed as just as eccentric and unusual as the play’s characters, when compared with a typical Australian family. It’s not that we are dysfunctional but I guess we are far from normal. I’ve simply never known anything different. 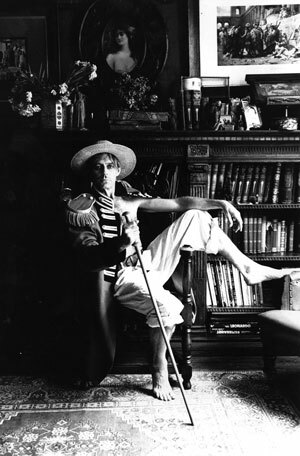 There was always a kind of ordered chaos to my home life, the order being fashioned by my mother, Sue, out of the confusion created by my dear eccentric actor/artist father, Baz. Luckily, I seem to have inherited the best traits of them both, so while I develop my film work in a world of colour and pictures and music rather than words, I am also obsessive about diaries and spreadsheets and databases. Dad actually did a production of Hay Fever at the Old Tote Theatre in 1978 and there is a fantastic photo from the production at home which I’d always noticed – with him in a striped blazer and a very dapper moustache. He looks completely at home in that period. He played Simon, the son. But the Bliss and Otto families line up better if you switch the genders: Baz is like Judith with his theatricality; I would be Simon; and my brother Eddie, with his love of sport, is definitely like Sorel in wishing our family were more normal. When I was very young and starting a new year at school, we had to do a show and tell to describe who our parents were. I was so proud to stand up and talk about my Dad, the actor, who I’d just seen on stage, naked, playing a mountain goat. (He was doing Night on Bald Mountain, directed by Neil Armfield.) But I should have known we weren’t like other families when Dad bought me green Doc Martens boots as my first school shoes. Of course, home for us has always been just home. Although the house itself is one of those huge old Victorian mansions – decaying grandeur, full to the brim with art and antiques and memorabilia from half a century of collecting. Hundreds of paintings and prints cover every wall, evidence of Baz’s obsession with 19th-century English art and the Pre-Raphaelites in particular, as well as his own drawings, watercolours and oils. Whenever our school friends would come to visit, they would be awe-struck by our home, as equally I couldn’t believe that some people lived in houses with bare walls. For my sports-obsessed brother, the huge rooms and high ceilings were perfect on rainy days for him to play a game of indoor cricket or soccer with his mates. The furniture would be pushed back against the walls – provided Dad was away at the theatre – and balls would fly around the room, occasionally hitting a chandelier. We kept a collection of crystal teardrops that had fallen off hidden away in the corner of the attic. Yes, we have an attic too, of the old-fashioned variety, full of books and boxes and childhood toys – I don’t think anyone in my family has ever thrown anything away. Miranda collected dolls at one point so there are a few of them with crazy glass eyes staring out from the attic’s darker corners. Cats have always been important members of our family and have lived long and happy lives in our crazy house. Cassie, a blue Oriental, was a fixture while I was growing up and, when, at 19, she passed, it was a family tragedy. Mum had to take her to be euthanised while Dad wept in the backyard and recited a T S Eliot poem about theatre cats. Now we have two beautiful Burmese, Bluebelle and Bogart (a girl named after Humphrey), who have become a full-time job for Dad with grooming and playing and feeding. Our family all get along brilliantly. 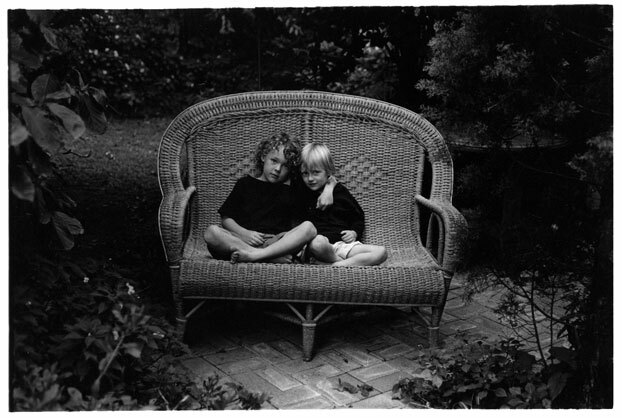 Miranda was at NIDA by the time I was born, so we never lived together, but she used to come to babysit. I distinctly remember when Peter O’Brien came to ask Dad if he could ask for Miranda’s hand in marriage. Peter was quite nervous and Dad was just laughing at him because he thought it was a joke. When my beautiful niece Darcey was born, we suddenly became an even closer-knit family – we spent all our time together having dinners and talking and taking Darcey for walks in the pram and didn’t seem to need anyone else. We would meet up somewhere in a park and find we were all wearing what we call the “Otto family uniform” – variations on French blue striped t-shirts. In the middle of our huge combined lounge and dining room, Eddie and I somehow talked Dad into having a ping-pong table which he thinks is ugly and covers in damask and linen tablecloths and crystal and china and candlesticks. It has become the setting for some fantastic family dinners when the old heavy cutlery (that I hate) gets brought out, and gravy is served out of a Don Bradman custard jug. We weren’t really a family that had big dinner parties but I do remember two occasions when we were allowed to stay up late with a house full of over-the-top theatrical party people. One was a party for Cate Blanchett and Andrew Upton before they got married. I taught everyone to play Chinese whispers which seemed to be a good idea. And, another time, Toni Collette told me that, whenever I was on the red carpet and there were photographers, I should give them the finger – I practised it in a stretch limo on the way to the film premiere of Cosi, flipping the bird to a busload of tourists – I was about 8 years old and a real tomboy with an obsession for dressing like my brother. Before we went to school, we weren’t really into Play School or Sesame Street. We loved Monkey Magic and dressed like the crazy Japanese characters. We also loved to watch Rolling Stones concerts and imitate Mick Jagger, wearing purple tights, purple turtlenecks and super long scarves and dancing the length of our house as if we were on his concert stage. Sundays were when our family really came to life. We’d always have people over and twice a year we would have our fantastic birthday parties. Our family friends were nearly all ‘in the industry’ as they say – actors, writers, directors – and those we saw regularly, because they had kids our age, included Gillian Armstrong, John Pleffer, Sandy Gore, George Miller, Judy Davis, Colin Friels, Noni Hazlehurst, Peter Carey, Michael Lynch, Jane Scott, Julia Overton, Tom Zybrycki, Hugo Weaving and so on. I didn’t really take much notice of them. To me, they were just Billie and Lou’s and Jack’s and Sam’s and Gussie’s parents. It was during my teenage years that I suddenly realised my parents’ friends were so much more interesting than the teenagers I was hanging out with and I started gate-crashing all their gatherings. Now, people like Gill and Julia are mentors to me and I am in such awe of what they have achieved in their legendary careers. We’ve got so many great photos and memories of all these amazing people in our house and backyard drinking and talking while the kids created havoc around the place. I remember once when one of the kids had an accident on the trampoline and was crying, one of his parents – who won’t be named here – just rolled her eyes and continued her conversation, while smoking a cigarette. I remember one of the other kids’ nannies once taught me how to cry. I got sand in my eye and she told me I had to cry to get it out and I refused for about an hour – I used to get so angry that the parents were often having a great lunch and we were hanging out with some nanny. I didn’t really have that much respect for all these famous thespians when I was growing up. Dad has an amazing studio in the backyard where he paints. It was an old coachman’s cottage and evidently it was so dilapidated and eaten out by white ants that anyone else would have knocked it down. But Dad set to having it restored and it’s an incredible space, all wide cedar boards and tiled fireplace and full of desks and oak bookcases and thousands of books – and paintings. There are hundreds of Dad’s canvases of various proportions, some huge and I don’t know where he would imagine we could ever hang them. But he always encouraged us to be creative and he would let me and my friends paint with oils on canvas, or do huge drawings with charcoal and we would end up black all over. Miranda actually has a few of my childhood paintings hanging up at her home. Dad has always been our biggest fan, whether he was at Eddie’s cricket matches or my dance concerts at Brent Street, where I was seriously the worst dancer ever. Miranda was obsessed with dancing and he must have us confused because he still tells people to this day that I could have been great, not knowing all the time that I was sneaking out of class to buy hot chips at the markets up the road. Thankfully, Mum, who has always been pretty switched on, worked out that I was more suited to playing sport, which she much preferred to ballet. One day at netball, I remember someone told me that there was a homeless man enthusiastically watching our game. It was Dad, who never understood the rules but was so supportive. He was doing King Lear and had grown a huge beard and it was cold and he had a big coat and scarf on and he was standing beside our trolley of plastic bags of bibs and balls. I think Dad gets very bored when he is not acting and will do anything to be the centre of attention around the house to the point where, when I was little, I used to say to him "why don’t you get up on the stage" pointing to a little elevated area he had built in our garden when we were kids for us to play-act on. These days, I live overseas, mostly in Los Angeles, but whenever I am in Australia, I always live at home. It’s a bit embarrassing sometimes, now that I’m 28, but I just can’t imagine living anywhere more interesting and there's always the cats – Bella and Bogart – who are really the centre of the family. We all love them above everyone else. On reflection, we probably have more in common with the Bliss family than I first thought. 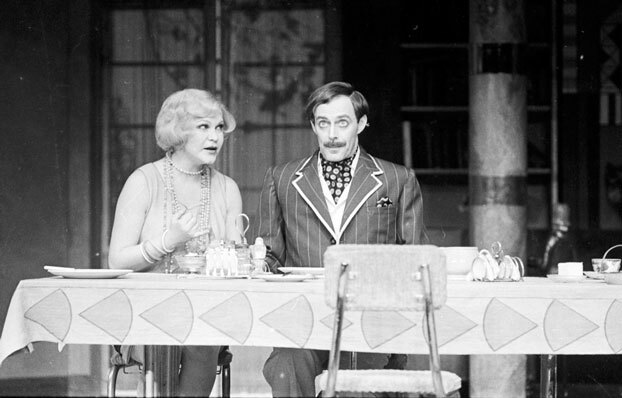 Barry Otto and Suzanne Roylance in Hay Fever, 1978, The Old Tote Theatre Company. Photograph courtesy of the Robert Walker Archive. Source: NIDA Archives. © Robert Walker/Licensed by Viscopy, 2016.